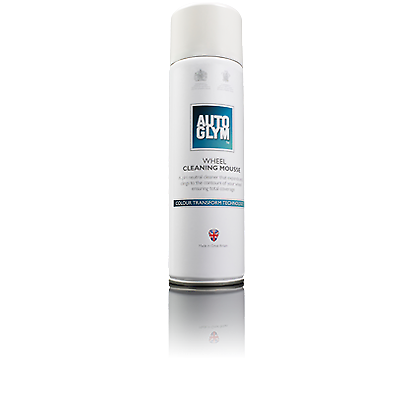 Autoglym’s new Wheel Cleaning Mousse could be the coolest thing to happen to wheels since ‘spokey dokeys’ adorned all BMXs in the eighties! Maybe. There are some preferable processes in car care that us enthusiasts occasionally refer to as a pleasurable, fun or extremely satisfying experience. ‘Wheels’ is not usually it! Simply spray a light coating of this stuff onto the surface of your alloy and watch it expand into a thick mousse that seeps into all those fiddly nooks and crannies, clinging to the contours and ensuring total coverage. Once it’s found its way to all the hidden spots and stops expanding, the satisfying, popping candy style, fizzing sound takes over and you can hear it getting to work instantly. Your next rewarding sensory experience is seeing the white mousse start to turn from a white to a deep red colour where it has been in contact with the brake dust. This reaction indicates that the brake dust has started corroding and is now loosened and ready to be agitated with your wheel brush for easy removal. A final bonus about this breakthrough product is that it’s pH neutral, so it’s safe for all types of alloys. It has an RRP of £12.99. All of Autoglym’s car care products can be bought online at www.autoglym.com, or at most leading car care retailers, including Halfords ENDS. Print article This entry was posted by admin on January 31, 2019 at 9:30 pm, and is filed under News. Follow any responses to this post through RSS 2.0. Both comments and pings are currently closed.